Blonde in this City: One Year. I'm not sure if I really mentioned this in the previous weeks I've been posting, but last Friday was my one-year anniversary of moving to New York City. It was meaningful and yet uneventful, which is perhaps the best of combinations for my life right now. When I decided to move here in September 2010, I'd never even been to the city. Or, really even east of Tennessee, unless you want to count Florida. But hey, I like to dream big. A few months after that, I received a decent chunk of money from a bad car accident I'd been in during the summer of 2009, saved most of it, took the rest, and made my friend Steve take a week off work and head out east with me. We stopped in D.C. for a few days, where my brother had been living since the previous fall (I've since been back more than half a dozen times, like my recent trip detailed here), then headed to NYC on the same day it snowed 19 inches of heavy, wet snow. Having never been here and knowing no one in the city, neither of us knew better than to really leave Midtown aside from our trip to the Met. I left not knowing when I'd be back. In August 2011, I was wrapping up my job as a manager/lifeguard at a pool I'd been visiting since childhood (where I'd worked for seven straight years), and I ended up in touch with an acquaintance who offered to help me with getting a place to live settled in the city. In October, we signed a lease, and I moved on the 12th of the month. I arrived to an apartment in Queens, in a neighborhood I knew nothing about, with no furniture, no job, no true friends here and a bedroom better suited to being a walk-in closet. On the 12th of October, 2012, I celebrated my anniversary after I left my full-time job where I manage a variety of online and media-related aspects with a dinner at a delicious Italian restaurant in Greenwich Village, surrounded by friends and great conversation. Afterwards, I headed home and curled up with wine, nail polish and several episodes of Downton Abbey. Sure, maybe I didn't celebrate the way most people my age would, but I honored it in a way that's true to myself (and got to wake up at a decent hour without a headache!). I got my job a few months after I moved & learned my way around this city as I went. I have made so many memories, new friends, good friends, added to my vast collection of crazy stories that happen in my life, tried new things, attended events I never could have dreamed I'd see before (New York Fashion Week [twice]? Hanging out with Ne-yo in the recording studio? Seeing the Paris Opera Ballet dance Giselle at Lincoln Center? All three, check), started dancing again, traveled around the East Coast and I still have so much more to do here! A lot has changed in my life over this past year, while other things have stayed the same. So, it was a lot like any other year of any other person's life. I miss my friends (especially Kaitlyn & Steve, & their dogs), and my family, and Des Moines and especially my dog, Mollie. But I would miss these opportunities I've been presented with even more. I have been blessed with the chance to get to know myself away from the influences of my childhood & youth and grow as a person each day. It has been a challenge, and will continue to be one, but I can't imagine a better one to face. I don't know where I'll be on the 12th of October, 2013, if I'll still be living in NYC or even the USA, but I do know I look forward to chasing my dreams and being dazzled by where they take me next. At the Metropolitan Museum of Art during my first visit, January 2011. 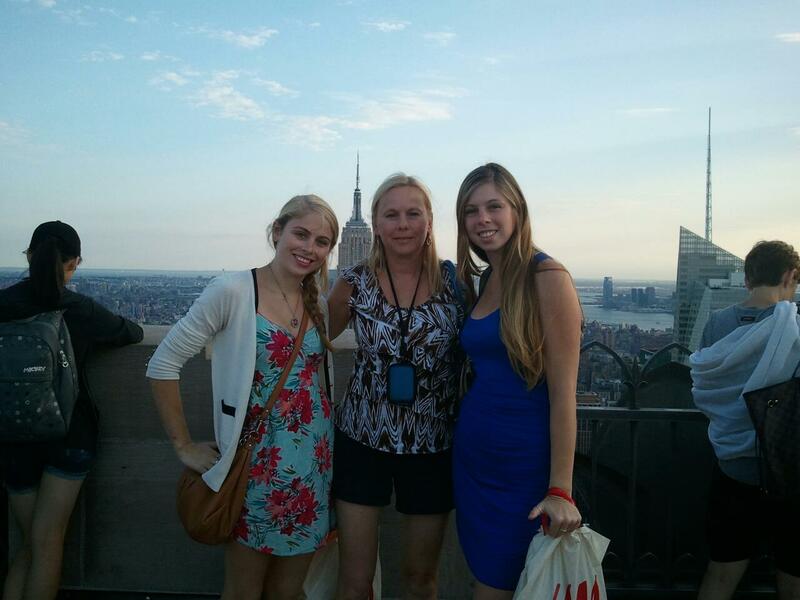 With my mom & sister on the top of 30 Rock in July 2012.